Following the events surrounding the Great Dragon's escape and aborted attack on Camelot, Morgana has disappeared and Uther has committed a great deal of his resources to finding her. 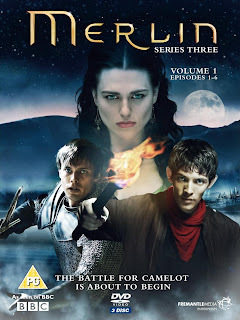 Unbeknown to Uther, Morgana has joined forces with her half-sister Morgause and King Cenred, Uther's sworn enemy, and plots to return home and undermine Camelot from within. It falls to Merlin to protect the castle from this new enemy within. Merlin's third year marks several slight changes to the established formulae from the first two seasons. The Great Dragon has escaped, although Merlin is still able to communicate with it and get its advice (although not as often as previous years; maybe John Hurt was charging too much money for his voiceover), but more notably, Morgana is now firmly in Camp Evil and is attempting to bring Camelot down from the inside. With only Merlin and Gaius aware of Morgana's evil status, much of the tension comes from the fact that Merlin cannot expose her without definitive proof, meaning circuitous plans must be enacted to save Camelot from her plans without endangering his own secrets. This new paradigm gives rise to a larger number of better-quality episodes than the first two seasons of the series, with more tension and more of the feeling of an arc plot to events. However, this set-up is not exploited to the hilt, and Morgana's evil smirking every time something bad happens (sometimes in public, which on at least one occasion actually drives part of the plot forward) gets a little ridiculous, as does her pouty, "Curses!" moments at the end of the episode when Merlin inevitably thwarts her latest scheme. I remember Katie McGrath being one of the more promising young actors on the show in the first season, but this year she is mostly reduced to a pantomime performance that rapidly becomes tedious. It isn't helpful that she is acted off the screen by Emilia Fox as her half-sister Morgause whenever she appears (which is satisfyingly often; Fox does scene-chewing 'evil' with relish and is hugely entertaining). A welcome new addition to the series is Gwaine, charismatically portrayed by Eoin Macken. At first he appears to be a stand-in for the missing Lancelot, but is less angst-ridden and more proactive in the story. Macken gives a great performance and adds some energy and humour to the series which it has been lacking as the main story becomes (relatively) grimmer. A less-accomplished newcomer is Tom Ellis, who does his best in the limited role of King Cenred but can't really overcome the fact that his character is a one-dimensional villain with no motivation. The relationship between Arthur and Merlin remains core to the series, although oddly the producers seem to have retreated this year from providing fanservice (the 'bromance' scenes from Seasons 1 and 2 seem to be limited this year). This is a shame as the two actors spark off one another very well and some exchanges between them are excellent, with an added touch of dramatic gravitas added as Arthur begins to value Merlin's counsel. There is also a nod by the producers to the original legends when Merlin has to take an aging potion to pose as an evil wizard and has to toddle around with a long beard and wrinkles (and a truly ridiculous line in evil banter). Angel Courby also shows real improvement in the role of Guinevere this year. She doesn't have as much to do as previous seasons, but when she does it's usually a more substantial role as her relationship with Arthur moves more into centre-stage. Effects-wise, Season 3 is more impressive than previous seasons. The producers were able to use MASSIVE (the computer programme developed by Weta Digital for use on the Lord of the Rings movies) to generate armies and have several pitched field battles and sieges. Whilst limited in scope (the actual CGI is nowhere near the level of that of a film, of course), these show an impressive increase in the ambition and scope of the series. There's also some great CGI creatures, particularly a hideous manticore that is more than a bit disturbing. Unfortunately, the two-year-old Great Dragon CG model is now looking a bit ropey outside of its dark cavern, especially in daylight, and could do with an overhaul. On the minus side, Season 3 does have a tiresome number of 'comedy' episodes (though one, involving Gaius being possessed, makes good use of Richard Wilson's comic skills) and there is a fair bit of wheel-spinning mid-season. But at the end of the season, when the Knights of the Round Table begin to form and Morgana's treachery becomes more blatant, events build up to a dramatic finale and another gamechanging moment which hints at a different (although not too different) show next year. Merlin: Season 3 (***½) is a more ambitious, more dramatic season than previous years, but its laudable greater ambition is undercut by some dodgy comedy episodes and staid performances. Overall, the show continues to fall far short of its full potential, but is still entertaining. It is available in the UK on DVD in two volumes. A ten-episode fourth season will air at the end of 2011. I gave up after Season 1, it was just too much of a kids show for me. Not to mention almost every episode was exactly the same. I know. between the semi-bad acting and (at least for the first two seasons) piss-poor CGI, could MERLIN really have worked better as a series for adults rather than kids? I Love It!!! However, i have no clue how to get the 3r season. i cant find it anywhere!! and it makes me so mad. netflix had the first 2 but not the 3rd..GRRRR!! im so mad! I enjoy the series very much as it evolves. As a fan of the medieval times from a myth and combat point of view it's great to see anything that grants us that backdrop and storyline. I love this show, I was sad to see it end, it was more for kids but I love how Arthur and Merlin grew up together as adults. A RENTAGHOST movie starring Russell Brand?